When you go shopping, it is really quite difficult to turn down the plastic bag, to refuse the refuse. We have been taught in school that biodegradable = ok in environmental terms and it takes some while before school-kids realise that in practical terms orange rinds and banana skins take sufficiently long to decay that they need better treatment than discard to pavement or hedgerow. Quite a lot of what follows came from wikipedia, evidently where I have left in or added links to elsewhere, link fails, see addendum  instead. Quite by chance I had my attention drawn to the problem of waste plastic. Out in the oceans, where current circulation is defined by air masses, not by the names of the local land, the slowly circulating water is called a gyre. These, by their very nature, have currents going around the edges, sit in the middle of huge patches of water and are seldom trafficked by man. A particular sailor, Charles Moore, was sailing the slow direct way home and couldn’t believe the amount of trash on the surface. Figure 8q-2: The following illustration describes the flow pattern of the major subsurface ocean currents. Near surface warm currents are drawn in red. Blue depicts the deep cold currents. Note how this system is continuously moving water from the surface to deep within the oceans and back to the top of the ocean. (Source: Arctic Climate Impact Assessment A third-generation resident of Long Beach, California, Charles Moore is the captain of Alguita, an independent oceanographic research vessel. In 1994 he founded the Algalita Marine Research Foundation (www.algalita.org), dedicated to research, education, and restoration of the marine environment. Since launching his ship in 1995, Moore, who received his captain’s license from the U.S. Coast Guard, has conducted ocean and coastal sampling for plastic fragments and debris across a wide swath of the northern Pacific Ocean.-ACIA). Each subtropical gyre is created by mountainous flows of air moving from the tropics toward the polar regions. 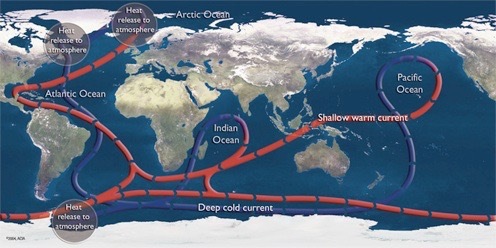 The air in the North Pacific subtropical gyre is heated at the equator and rises high into the atmosphere because of its buoyancy in cooler, surrounding air masses. The rotation of the Earth moves the heated air mass westward as it rises, then moves it eastward once it cools and it descends at around 30 degrees north latitude, creating a huge, clockwise-rotating mass of air. The rotating air mass creates a high-pressure system throughout the region. Those high pressures depress the ocean surface—actually push it down a fraction—and the rotating air mass also drives a slow but oceanic-scale surface current that moves with the air in a clockwise spiral. Winds near the centre of the high are light or even calm, and so they do not mix the floating debris into the water column. 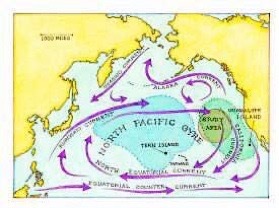 This huge region has become an sink for debris from the North Pacific rim, as well as from ships at sea. 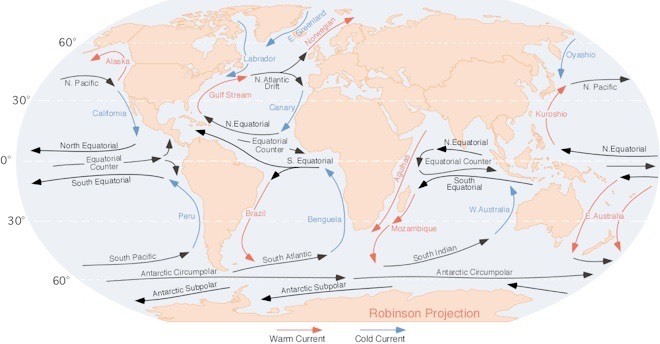 “The subtropical gyres are also oceanic deserts – in fact, many of the world’s land-based deserts lie at nearly the same latitudes as the oceanic gyres. Like their terrestrial counterparts, the oceanic deserts are low in biomass. On land the low biomass is caused by the lack of moisture; in oceanic deserts the low biomass is a consequence of great ocean depths.” You might explain to me whether this is coincidence or not. The spaces we are considering here are truly huge; maybe 40% of the whole of our ocean surface, a quarter of the whole planetary area. The centre of each gyre is relatively stationary (the area around the 50º line is often referred to as the horse latitudes) and the rotation draws waste material in. While historically this debris has biodegraded, the gyre is now accumulating vast quantities of plastic. Rather than biodegrading, plastic photo-degrades, disintegrating in the ocean into smaller and smaller pieces. Oddly, it is this steady photo-degradation that threatens the most, I argue below. These pieces, still polymers, eventually become individual molecules, which are still not easily digested. The photo-degraded plastic basically act as sponges for all sorts of widely distributed poisons. The floating particles also resemble zooplankton, which can lead to them being consumed, entering the ocean food chain. 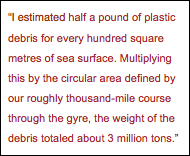 In samples taken from the North Pacific gyre in 2001, the mass of plastic exceeded that of zooplankton (the dominant life in the area) by a factor of six. Charles Moore indicates that ocean currents have added to the mass until it is now about the size of Texas. You would think that entanglement and indigestion would be the major problems. Not so, apparently. Environmental geochemists (now there’s a job description) at Tokyo University have shown that floating plastic fragments accumulate hydrophobic—not water-soluble—toxic chemicals. Plastic polymers, it turns out, are sponges for DDT, PCBs, and other oily pollutants. The Japanese found that plastic resin pellets concentrate such poisons to levels as high as a million times their concentrations in the water as free-floating substances. Even as single molecules, the polymers of plastics are indigestible. Even those single molecules must be somehow further degraded by sunlight or slow oxidative breakdown before their constituents can be recycled. We have no data on how long such recycling takes in the ocean—some ecologists have made estimates of 500 years or more. We can only guess what the consequences of dispersion of such toxically loaded plastic fragments will be. There is an irony, too. The debris is re-entering the oceans whence it came; the ancient plankton that once floated on Earth’s primordial sea gave rise to the petroleum now being transformed into plastic polymers. That exhumed life, that ‘civilized’ plankton, is competing with its natural counterparts and with those life-forms that directly or indirectly feed on them. So, next time you’re offered a plastic bag, at least try to refuse it. It is hard; it takes commitment, or at the very least, practice. Reuse the plastic bags you have until they can no longer be used. Try not to add to the problem. Encourage the use of paper bags, which we know how to recycle and which biodegrade well. Take a bag with when you go shopping. Keep one in a pocket of each coat so you have one. Dare to speak to shop staff about uses of plastic. Make it your problem. Be part of the solution. Of the planet, not just on it. DJS 20070818, from a Dale’s assembly, PMC, Nov 2006. Top pic: Major ocean currents of the world. On this illustration red arrows indicate warm currents, while cold currents are displayed in blue. Original found here. Revisiting this page in early 2018 in partial response to similar material on facebook today I am disappointed to discover that (m)any of the links fail because they have been, one way or another, removed. Charles Moore’s entry may now be found in a book. I found an update interview (2017) with Capt Moore here. The change, as reported in several ways that have come to my attention in the last few weeks, is that the plastic has broken down into steadily smaller pieces, so that we have a ‘new’ problem, that the particles of plastic are sufficiently small to do all sorts of damage quite different from what was being observed in 2007. Thsi means that while a net might well remove the newest material, it does little to cure the longer-term problem. I suspect I need to write at length, essay 242.Update material on the content on this page is probably sufficient from this source, http://www.popularmechanics.com/science/environment/a6046/how-bad-is-the-plastic-pollution-in-the-atlantic/ My quick scan of that spotted this: even though there was a fourfold increase in discarded plastic in the U.S. between 1980 and 2008, the concentration of debris in the Atlantic does not seem to have increased over that time. Which might be telling us that the plastic in these places has disappeared beyond the search, into the depths, into animals and/or down to sizes too small to be caught. If the latter, we’d very quickly see the enormous size of the future problem of what essay 242 calls nanoplastics, nanometres sized particles of plastic. I also note, as demonstrated here, that we’ve been told about this since the early 1990s, when I didn’t notice until 2006. Shame on me. Adding sites visited in 2018, I may have missed some. I certainly (re)discover the extent to which the internet has turnover. https://algalita.org/ who date the 'Great Plastic Awakening' at 1999. Try Insights. Subsequent essays on this 106, 150, 177, 242 several on Air Quality, such as 104. Maths pages on Pollution (lower) and Pollution (higher).